Wherever you go, whatever you do, you will never be able to go beyond yourself. Start a journey of bringing the best in you through self-discovery and career development! Enroll at Discover Yourself: Build A Career and Make an Impact! Chapter 1: Personal Development: What do you love doing? Chapter 2: Professional Development: What do you do well? Chapter 3: Community Development: What is the community around you? Chapter 4: Sustainable Development: What the world needs? Empowerment is defined as a way to provide tips and opportunities for youth to develop the competencies they need to become successful contributing members of their communities. The MOOC is part of a youth-strategic partnership project titled “Cease Cowering: Youth Empower Action Here!” (CC: YEAH) supported by the programme Erasmus +. The project is based on partnership between the Association for Education Mladiinfo International from Macedonia, Mladiinfo Slovensko (Slovakia), The Global Experience (Germany) and iversity (Germany). As a part of the project, the course content was developed, the video shooting was organized in Bratislava, Slovakia and a special brochure containing the materials from the course was produced. The expected project results can be summed up as following: - Development of an innovative approach in the process of self-learning based on Open Education Resources; - Enlarged awareness on required skills and competences needed for youth career development; - Increased soft, entrepreneurial and digital skills of youth through non-formal online education opportunities; - Created a strategic approach and mutual action on youth development among involved partner organizations. The project has been funded by the National Agency of European Educational Programs and Mobility through the Erasmus Plus program. Discover Yourself: Build a Career and Make an Impact will be an inclusive, free and open course for all vision-driven, knowledge-hungry and goal-oriented young individuals. We aim to attract young people aged 18 to 30, from all around the globe who are eager to work on themselves and to grow both personally and professionally. The idea is to provide those interested youth with concrete skills and tools to boost their potentials as well as to bring relevant information to them that will encourage them to undertake concrete activities in the communities where they live. In the same time, we are also targeting youngsters who have fewer opportunities and face economic, social, educational or geographical difficulties and through the MOOC we want to bring them closer to the world of opportunities. The whole course content will be organized around 4 chapters devoted on: personal, professional, community and sustainable development. - Identify exactly what you want and what you do not want to do. - Identify the skills which you can offer as well as learn about your current skills gaps. - Summarize your achievements and skills in appropriate formats for future employers or academic institutions. - Discover how your career choice can influence the world challenges. This is an introductory course. Previous knowledge is not required. The course is designed for people interested in building up a career and make an impact. Our journey to self-discovery will start from the personal development. In the first chapter, we will give you the overview of your personality and how it could influence your career choice. In the three chapter units, you will identify what the personal values you appreciate the most are and how these values are influencing your choices. Also, you will be guided to discover your personality type and will have a chance to test yourself and find out which personality type you belong to and how you can connect it to your potential career. Once you have discovered who actually you really are and what you love doing, it is time to see what kind of career will fit your personality and interests. Your professional self is under huge pressure lately, right? So many trends, reports and statistics show new, undiscovered ways of working and imagining your job of the future. But nothing will ever make sense unless you get to know your professional self and make choices based on your skills, needs and capacities. In this chapter you will be able to walk the thin line between self-discovery and self-creation, while articulating your experience and skills into a successful career plan. In the Community Development chapter, we will help you discover what and how the empowered YOU can do for your community, for your peers, for your neightbours. In this chapter, we will show you the ways how you can make an impact: as an individual, as part of non formal group, and as a member of an organization. At the end of the chapter, you will be able to identify a project idea, draft a basic proposal and find a suitable programme where you can apply for a project grant for your idea. But first and foremost, you will be inspired to take the community in your hands and move the things forward! In the last chapter we will take a step back. What is the big picture? What are the challenges in the world today? We will speak about Sustainable Development Goals and discover ways how you can expand your circle of influence. We will finish the course with three elements of sustainable development - the economic, social and environmental. We want to motivate you to take personal social responsibility for your surrounding and for the whole world. At the end of the course, the students will be able to draft a personal development plan that will present their pathway to their personal, professional, community and sustainable development. Founder and co-creator of Mladiinfo International.She have been active in the field of youth empowerment and youth skills development since 2008 and is one of the main supporters of youth leaders in the region of Central and Eastern Europe. In the last 8 years she initiate different programs and projects that helped young people to fulfill their educational potential and be more competitive at the job market. She is also initiator of the youth platform for free education possibilities mladiinfo.eu that serves 1.5 million youth over the Globe with fresh information about formal and non-formal education, jobs, internships etc. She finished her master studies in Human Rights at Bologna University and specialized communication sciences at Rutgers University in New Jersey, USA. Ana describes herself as a vision-driven, goal-oriented and free-spirited people-lover. She reflects her passion for youth work in her work activities as Director of Program Development at the Association for Education Mladiinfo International. The mission of the organization is to help the young people from the world that need a particular support to fulfill their educational potential as they are challenged by many educational disadvantages caused by either personal, social, cultural or economic circumstances. 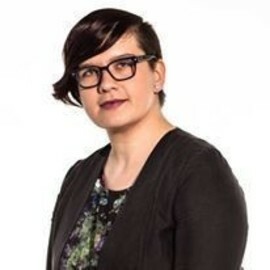 Ana is in charge of idea-generation, project writing and implementation of the programme activities. Moreover, she participates in the strategic organizational planing, network activities as well as ensures compliance of the programmes with the mission and vision of Mladiinfo. She has been active in various civic society organizations in the last 10 years and continuously gives an imprint on the national and regional youth policy by participating in various policy-making events and groups. Being a scholarship-holder of more than 10 international programmes, she is looking forward to share her personal experience and available opportunities with all the youngsters ready to get empowered. Except in youth empowerment, Ana's interests are in the fields of diversity and intercultural dialogue, information, media and journalism, as well as in formal and non-formal education. Her professional background is in the civic sector, both as a youth worker and as a journalist, although she has also experience working as a young researcher and she was a member of the young teaching staff at the Ss. Cyril and Methodius University of Skopje. Ana posses a Master degree in Interdisciplinary Research and Studies on Eastern Europe (MIREES) by University of Bologna as well as a Master degree in Media and Communications, obtained at Ss. Cyril and Methodius University - Skopje. Together with the other course instructors, Ana will be here to support you during your course participation. 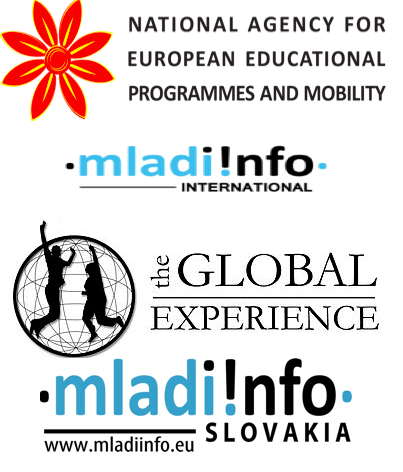 This MOOC is a joint cooperation of 4 organizations: Mladiinfo International, Mladiinfo Slovakia, The Global Experience and Iversity and it has been supported by the Erasmus + programme. Co-creator of Mladiinfo International and Impact Hub Skopje (candidate), Bistra is best described as a community innovator, entrepreneur and a poet. She spends her time inspiring, witnessing and supporting courageous steps made by humans, combining innovative tools for growth, learning and education. 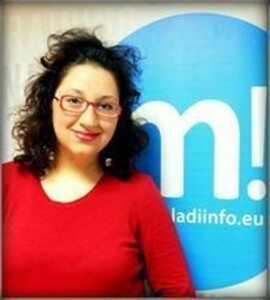 In 2008, she became one of the core drivers of a movement that resulted with today's most popular youth web portal in CEE Region: Mladi Info (www.mladiinfo.com), enabling hundreds of young people to get access to free education, mobility and grants in a fully transparent way. Her passion for entrepreneurship took her on a journey through Europe, Sub-Sahara Africa, and South-East Asia, supporting young people to create meaningful jobs for themselves. At the moment she lives in Austria, where she is regional program coordinator for Social Impact Award and Investment Ready Program, enabling social entrepreneurs in CEE region to build or scale their social start-ups. In 2016, she started the first impact accelerator in Macedonia, under the umbrella of Impact Hub family,. She has organized, facilitated and shared her experience at more than 73 international conferences and summits so far. He has been active in youth work, youth education and international projects for youth since 2010. 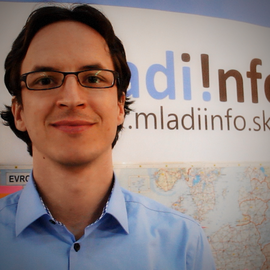 Chairman and Co-Founder of Mladiinfo Slovakia - NGO with mission: “Helping to inform young people about the educational opportunities around them.” He has a PhD. degree in economics. 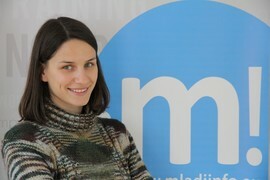 Marija Matovska is manager for social business in the Association for Education- Mlаdiinfo International. Marija is co-founder of the Youth Council of the American Embassy. In the past, she has been working as a marketing agent in Fashionel.mk and as project coordinator in Health Education and Reserach Association- H.E.R.A. 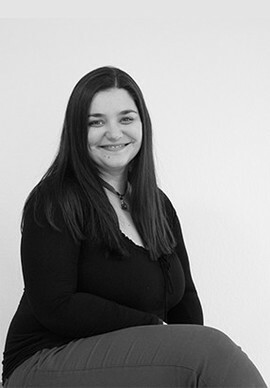 Marija holds master degree in e-business management. Beside her dedication to the social entrepreneurship, marketing and business, she is also passionate about the files in society related to human rights, sexual and reproductive health and people with disability. Because of that Marija is part of few organizations and informal initiatives, such as: Inclusive solutions, Trisomija 21- Skopje, Vo mojot svet etc. Marija is practicing healthy life style, including yoga and mountaineering sports. She is also part of the mountaineering club Ljuboten - Tetovo and the alpine club Matka- Skopje.